eLocity A7 is a 7 inch tablet which comes with Android 2.2 on it, a price tag of $312 and decent performances, which makes it worth buying if you prefer something that will not sink your budget but still allows you to do most things you can do on the more expensive iPad. Despite the fact that the company making it isn’t one of the giants, so you’re not getting a Dell or a Samsung tablet, the quality is pretty good and you definiately have a contender for the other major 7 inch tablets available right now, like the Dell Streak 7 or the Samsung Galaxy Tab. 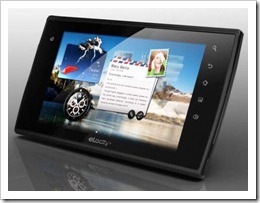 The eLocity A7 comes with specs that are quite similar to those offered by its main competitors. The 1GHz processor Tegra 2 is the same one that is also used on the Dell Streak 7 and it allows you to play games and watch movies at Full HD quality on a TV, via the HDMI connection. 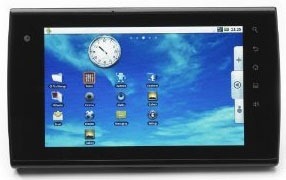 The 7 inch capacitive touch screen comes with a resolution of 800×480, the same as the Dell Streak 7, but a bit lower than that offered by Samsung Galaxy Tab (1024×600). The A7 also has 512MB of RAM, 4GB of internal storage (which can be expanded via a microSD card by another 32GB), stereo speakers and a 1.3MP webcam (clearly, not its strongest feature). Thanks to all the ports that come on it, you have plenty of connectivity. It has a USB 2.0 port as well, so you can use a USB drive to transfer files to it. The HDMI port can be used to connect the tablet to a TV and play 1080p content on a big screen. Other features include a docking port, microphone and the headphone jack. The design of the tablet is well done and it looks slick and well designed. A very nice feature is how easily it switches from portrait to landscape mode, thanks to its 3 axis accelerometer. On it, you can do portrait, landscape and reverse portrait rotation, so not a complete 360 degree movement. The color used for the chassis is Piano black and the eLocity A7 certainly doesn’t look cheap. The ports all come with small flaps made out of plastic which protects them, a very nice feature if you want to avoid getting water or dust in them by accident. All in all, the design seemed well polished. The eLocity A7 tablet comes with Android 2.2 Froyo as the OS, with no news at this point whether it will get Android 2.3 in the future. Adobe Flash is a nice feature to have on a tablet, so you have the option of accessing YouTube videos and playing other online games that use it. Applications can be installed from GetJar, which is an alternative to the official Android appstore, which the A7 can’t access. You also have the choice to install some common apps from eLocity, including Live Messenger, Amazon, Kobo Reading, Facebook and eBuddy, among others. As for the preloaded apps, eLocity A7 comes with the standard apps for web browsing, calculators and so on, but it also comes with options for reading ebooks, including Kindle and FBreader or Aldiko. It offers a very good web browsing experience and the pages load quickly. The Flash works well, for the most part, some Flash games crashing, but others worked well. Initial versions of the tablet apparently had some problems with the pinch and zoom function, but software updates fixed that problem. Its 1Ghz Tegra 2 processor allows it to play high quality videos (1080p) and you can even view it on a Full HD TV via the HDMI connection. The experience is very good in this area and you can even play 3D games on it. The tablet can play vides which use codecs like MPEG-4, H.264, Real Video. The file formats for these videos are MKV, AVI, MP4, FLV and MOV. These should be sufficient for almost anyone when it comes to seeing movies. The downside is the webcam which comes included with it, of 1.3MP. Clearly it’s an area where they saved money and while other tablets come with 2 cameras, at least one of them being much better than this one, the eLocity A7 is not designed for taking photos or shooting video. You can use it for chat purposes, but that’s about it. The eLocity A7 tablet is a quality model, which offers you a lot in exchange for the ~$300 you pay for it. It does have some downsides, like the 1.3MP webcam, but overall it’s money well spent since and there are no huge disadvantages. Obviously, you can’t expect the same feeling like you would get from an iPad, but even though you’re paying only half the price, you get quite a bit of quality.